Turkey Hill Ice Cream is the name of a dairy house that is famous for its rich ice cream available in a wide variety of flavors. The company specializes in producing a host of other dairy products including drinks and frozen deserts. The company has come a long way to establish itself as a market leader in its niche. About 60 years ago during the time of the Great Depression the man behind the development of the company, Armor Frey would actually sell milk bottles in his neighborhood of Pennsylvania Dutch Country. Frey started out the milk business as a means of earning a few extra bucks in those economically testing times. However, on experiencing unflinching success he dedicated himself to milk business full time. In 1947 Charles Frey along with Glenn Emerson would buy their first dairy house with all the customers living in a few miles radius. They would simply milk the cows and provide delivery services in the neighborhood to earn their bread and butter. The Frey brothers decided to expand their dairy operations into ice cream production in the 1980s. This resulted in the formation of Turkey Hill Ice Cream which became an instant success in the surrounding Lancaster County stores. They managed to persuade a number of retailers and independent stores in and around Philadelphia to try out their new product. On doing so they realized that it was a great success. Turkey Hill Ice cream was known to be of great quality and moderately priced so that the masses could enjoy it. On experiencing the success of their first few products the brothers launched light ice cream for the weight conscious and followed that up with the production of frozen yogurt. 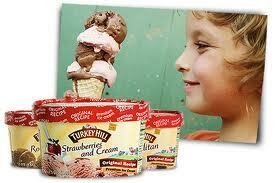 Today retailers all over the country import Turkey Hill Ice Cream from Lancaster Country. The list of products offered by the company now includes ice cream sandwiches, iced tea, sundae cones, drinks and other frozen deserts. The good thing about the company is that despite the unflinching success they have managed to retain their traditional method of making the ice cream to ensure good eating. The family run business is now headed by the grandson of the founding fathers, Quintin Frey. Unlike other brands, Turkey Hill Ice Cream has still maintained a relatively low profile in order to retain its integrity. They strive in producing high quality products that are moderately priced so that the masses can enjoy it. This, the current president says, is more important than bragging about the business. The first ice cream that the company began its production with was strawberry flavored. Today, however, the spectrum of flavors offered by the company has been widened to offer some of the most exquisite ice cream flavors around. Similarly their ice cream sandwiches and sundae cones are considered as being great old school treats. Their collection of drinks is marketed as “Cold fashioned for freshness” laying emphasis on the traditions that the company strives to maintain.